Cafe Americano is always open and always a good place to stop for a quick bite or a filling meal. With traditional American comfort food and some dishes with a spicy Latin twist, you are sure to find something to fill your cravings. 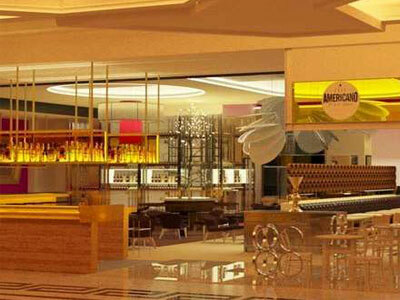 Located conveniently in the lobby, the relaxed atmosphere will beckon you in for a drink in the famous bar. You can get breakfast anytime day or night, so try the special late night menu and the hangover-curing Bloody Mary. The menu is vast and has selections for breakfast, brunch, lunch and dinner. Be sure to try the buttermilk fried chicken for a true comfort food. Also available is a “Lunch-Box” menu and a Taco Tuesday menu.